Year four arts worksheets help teach your child about dance, music, stand-up comedy, circus arts, and more. If your eight- or nine-year-old was born to be on the stage, he'll enjoy learning about the ins and outs of performing arts with these worksheets. Not only will your child learn about the general practices of different artistic mediums, but he'll also learn about famous artists in history, stage makeup, and even how to perform his own magic tricks and songs. Try year four arts worksheets with your young artist. 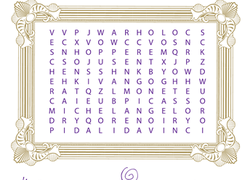 Encourage your child search high and low for the hidden names of famous artists with this fun word search. Swords and sorcery, knights and dragons! Your little one can create his own epic tale on this comic activity sheet. It's the fastest turtle in the world! This worksheet shows you how to quickly and easily draw a turtle using just a few basic shapes. Your young artist can use this handy guide to draw a frog using just ovals. Learning to use basic shapes can open things up for a kid who likes to draw! Want to impress and amaze your friends? Try out some of these easy magic tricks for kids.